What is water? We often take this odd substance for granted, and because we take it for granted, we rarely think of it as odd. Still though, it is one of the few substances that defies the consistency of physics expanding when it becomes a solid whereas most other substances contract. Despite being composed of hydrogen and oxygen, two highly combustible elements, it is relatively inert and neutral (7 on the pH scale) while simultaneously being a universal solvent. It fuels our bodies, our brains, and in some cases even our cars (check it out: http://www.youtube.com/watch?v=CrxfMz2eDME). Because so much of our body is composed of water, we consume a lot of it either directly or indirectly. It’s in the liquids we drink (yes, even alcoholic beverages are mostly water), and in the food we eat (even steaks contain a good amount of water). When we think about cooking, we often associate it with applying heat to foods. There are a few exceptions granted (Cooking with Acid, Cooking with Cold, Cooking “Raw”), but this is largely true. To this end, water exists in two states that are important to us in cooking – as a liquid, and as a gas. In these two states, it allows us to use it as a medium of transfer for heat. Without the ability to transfer heat, the surface of our ingredients which touch our heat source would simply burn, while the rest of our ingredients will remain raw. As a fluid (either water or gas), water molecules are free to move around. 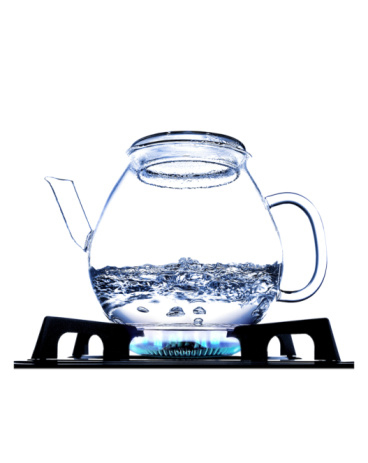 We don’t often think about this, but when we boil water, the whole pot of water isn’t actually the same temperature – that is, the heat is not evenly distributed though we generally assume it is. Instead, the water that touches the bottom of the pot is heated by the fire. Water once heated, the water becomes less dense, expanding as things do when heated, and quickly moves upwards to be mixed back in with the rest of the water in the pot. All the while, this makes room for the colder water to sink to the bottom of the pot. This is, in a word, convection. So as you can see, while air is generally considered an insulator, water is 24x better of a thermal conductor while compared to metals such as stainless steel (cookware), it is 27x less efficient a conductor. What water does have going for it though, as mentioned before, is convection – circulation of heated molecules of a fluid. As the heat water rises and slowly diffuses back into the rest of the pot of water, the average temperature of the water increases so that the temperature of the water at the top, is somewhere close to the temperature of the water near the bottom. Were the molecules of water not be allowed to move, water would not be a very good cooking medium. But because they can, this is why it is important to have enough water when you’re cooking because it acts as a cooking medium for heat transfer and lets you cook that chicken evenly in say chicken soup. An extreme example of convection is when water boils. The water at the bottom of the pot is vaporized into steam and bubbles up to the top again making room for colder water to touch the bottom and get heated up itself into vapor – and I’m sure all this time you thought as I did younger that it was just giving up air! Water boils at 100 C or 212 F … most of the time anyway. As with all things, there are exceptions as this is true only when you’re boiling water at sea level. At higher altitudes, water actually boils at a lower temperature; conversely, at higher temperatures at lower altitudes. This is because of vapor pressure – a phenomenon we can take advantage of later. Bringing back painful high school memories, I wanted to remind you of the interesting fact that while water boils, it remains at the same temperature until it changes states. Again, without changing the vapor pressure surrounding the water you are trying boil, it can never be at a higher temperature than 212 F. This also means that anything you cook submerged in water, will achieve a maximum temperature of 212 degrees. Time and heat are both important factors in cooking and there is usually an inverse relationship between the two. To tenderize meat for example, you usually have to use a high heat for a short period of time, or low heat for a long period of time (e.g. low and slow BBQ). If you have a maximum temperature dictated by your cooking medium, then your only recourse is to extend the period of time used to cook your ingredients (unless of course you have one of these babies: pressure cooker ). Sometimes this is a problem, some times it is not. This is great for example, if you are cooking something like soup, or casserole where the added time will allow flavors to meld. Remember, after all, water is a good medium for dissolving flavors into. Mike alludes to this as well in his article on Olive Oil Infusions and the transfer of flavors. In reference to oils, another alternative for achieving higher cooking temperatures if need be, is by using a fluid which only evaporate at higher temperatures. This is where ingredients such as oils come in. Oils have a much higher vaporizing point (aka smoke point), and because of this, can transfer higher amounts of heat much more quickly which is why they make such an effective medium for activities such as frying. When you fry something, large amounts of heat are transferred to food very quickly which causes the water in your food to quickly evaporate. In this case, you are bringing the heat to your ingredient via the oil rather than using the water to bring the heat to the ingredient. As the water from the surface of whatever you’re cooking violently evaporates away, your food will come to a crisp nicely. This is also why it’s important to get your oil to the right temperature and to use a sufficient amount of oil when frying. It will be less oily with a higher temperature and more oil because it will hold it’s temperature better, and the evaporating water will keep most of the oil out, than if you only use a sparing amount of oil to fry with which will lose its temperature fast and then soak your food with oil instead of crisping it. More on cooking with oils later. Getting back to talking about using water as a transfer medium, we have to talk specifically about aromatics and how to flavor the water with more than just salt, and using it to bring the flavors of ingredients together rather than diluting them and separating those flavors. More to come on this as well! Stay tuned for these and other topics! Copyright © 2019 Cook on the Bias. All Rights Reserved. Magazine Basic created by c.bavota.